20 MMS November 2017 mmsonline.com THE Z AXIS Commentary all about maximizing the use of productive capac- ity, he says. Physical and digital tools both serve that aim, and frequently it is the latter that offers shops the most promise. Industr y 4.0 was the theme of EMO. More specifically, the theme as written by the show's organizers was "Connecting systems for intelligent production." The embrace of this theme strayed toward the overblown. In some cases, equipment providers seeming to offer not much more con- nectedness than a USB por t trumpeted their readiness for Industry 4.0. And I don't think that trumpeting much mattered, because I doubt a serious equipment buyer was shopping on the basis of whether that equipment could claim a fit with a concept that is still so broad and vague in its outlines. But even so, even if the outlines may be vague for now, those outlines still contain an important idea, and maybe the most important idea that manufacturers now confront. Namely: Interconnectedness allowing for freely flowing data up and down manufacturing processes and organizations will allow for freedoms, capabilities and efficiencies we haven't yet imagined. Fastems was in the Industry 4.0 area because it sees this promise and wants others to see it, too. Or "see" it, quote marks added. 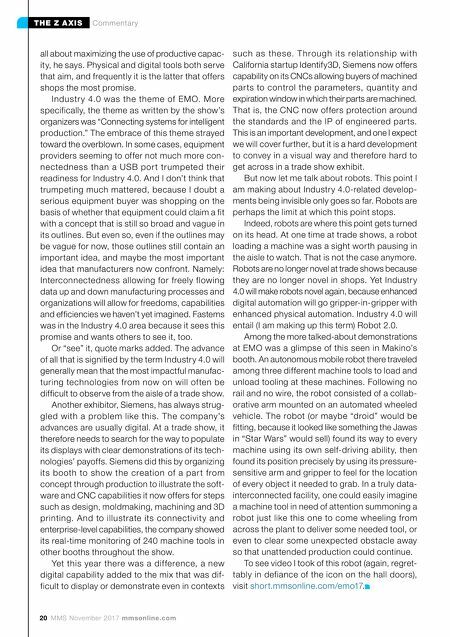 The advance of all that is signified by the term Industry 4.0 will generally mean that the most impactful manufac- turing technologies from now on will of ten be difficult to observe from the aisle of a trade show. Another exhibitor, Siemens, has always strug- gled with a problem like this. The company's advances are usually digital. At a trade show, it therefore needs to search for the way to populate its displays with clear demonstrations of its tech- nologies' payoffs. Siemens did this by organizing its booth to show the creation of a par t from concept through production to illustrate the soft- ware and CNC capabilities it now offers for steps such as design, moldmaking, machining and 3D printing. And to illustrate its connectivity and enterprise-level capabilities, the company showed its real-time monitoring of 240 machine tools in other booths throughout the show. Yet this year there was a dif ference, a new digital capability added to the mix that was dif- ficult to display or demonstrate even in contexts such as these. T hrough its relationship with California startup Identify3D, Siemens now offers capability on its CNCs allowing buyers of machined par ts to control the parameters, quantity and expiration window in which their parts are machined. That is, the CNC now offers protection around the standards and the IP of engineered par ts. This is an important development, and one I expect we will cover further, but it is a hard development to convey in a visual way and therefore hard to get across in a trade show exhibit. But now let me talk about robots. This point I am making about Industry 4.0-related develop- ments being invisible only goes so far. Robots are perhaps the limit at which this point stops. Indeed, robots are where this point gets turned on its head. At one time at trade shows, a robot loading a machine was a sight worth pausing in the aisle to watch. That is not the case anymore. Robots are no longer novel at trade shows because they are no longer novel in shops. Yet Industry 4.0 will make robots novel again, because enhanced digital automation will go gripper-in-gripper with enhanced physical automation. Industry 4.0 will entail (I am making up this term) Robot 2.0. 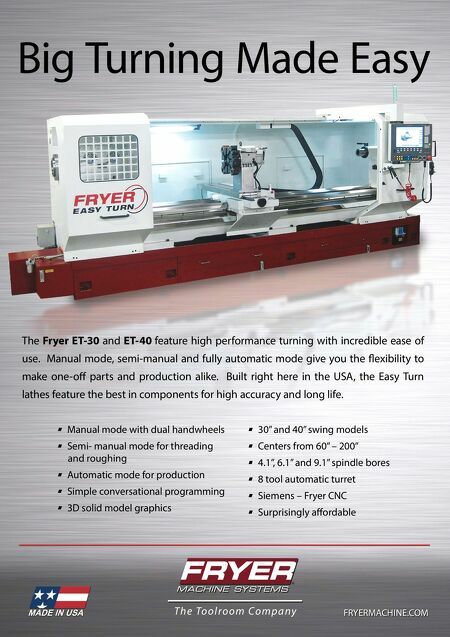 Among the more talked-about demonstrations at EMO was a glimpse of this seen in Makino's booth. An autonomous mobile robot there traveled among three different machine tools to load and unload tooling at these machines. Following no rail and no wire, the robot consisted of a collab- orative arm mounted on an automated wheeled vehicle. The robot (or maybe "droid" would be fitting, because it looked like something the Jawas in "Star Wars" would sell) found its way to every machine using its own self-driving ability, then found its position precisely by using its pressure- sensitive arm and gripper to feel for the location of every object it needed to grab. In a truly data- interconnected facility, one could easily imagine a machine tool in need of attention summoning a robot just like this one to come wheeling from across the plant to deliver some needed tool, or even to clear some unexpected obstacle away so that unattended production could continue. To see video I took of this robot (again, regret- tably in defiance of the icon on the hall doors), visit short.mmsonline.com/emo17 .